This is a great restaurant to "fall back on" if other reservations don't work out. 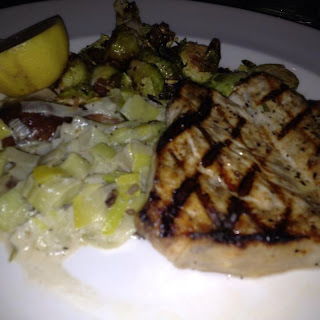 Not only are they good for last minute reservations, Devon Seafood Grill has delicious fresh fish options and also more gourmet twists on typical classic dishes. Some menu options are "hit or miss" but overall most people leave happy! Looks like a mess! But all of that together is the Lobster Tamale! But I was disappointed... 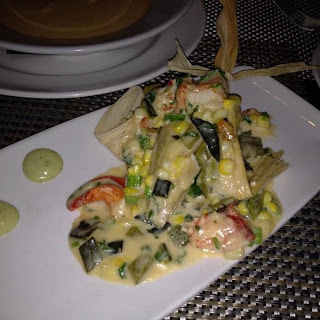 The tamale is topped with plenty of lobster, corn, roasted poblano peppers, cilantro, and an avocado crema. It was disappointing because the tamale had no flavor... It was plain massa and instead of cooking ingredients within it, they just piled it on top. The toppings were delicious but you could put it on top of rice or bread and it would be the same. They need to somehow incorporate it more into the massa dough! 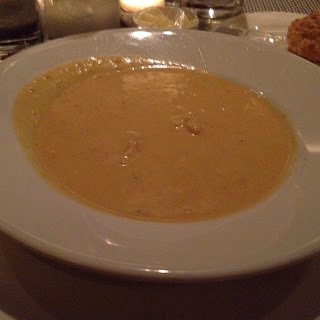 Extremely creamy and rich lobster bisque! It had a few chunks of lobster and was very smooth. This isn't the watered down version you get at other places. because of the richness, I don't suggest getting a huge entree... grilled fish or one of their salads would pair well with this soup. I do suggest you dip the homemade biscuits in this soup! An excellent appetizer... this flatbread is topped roast duck, sliced apples, thinly sliced red onions, and gorgonzola cheese. 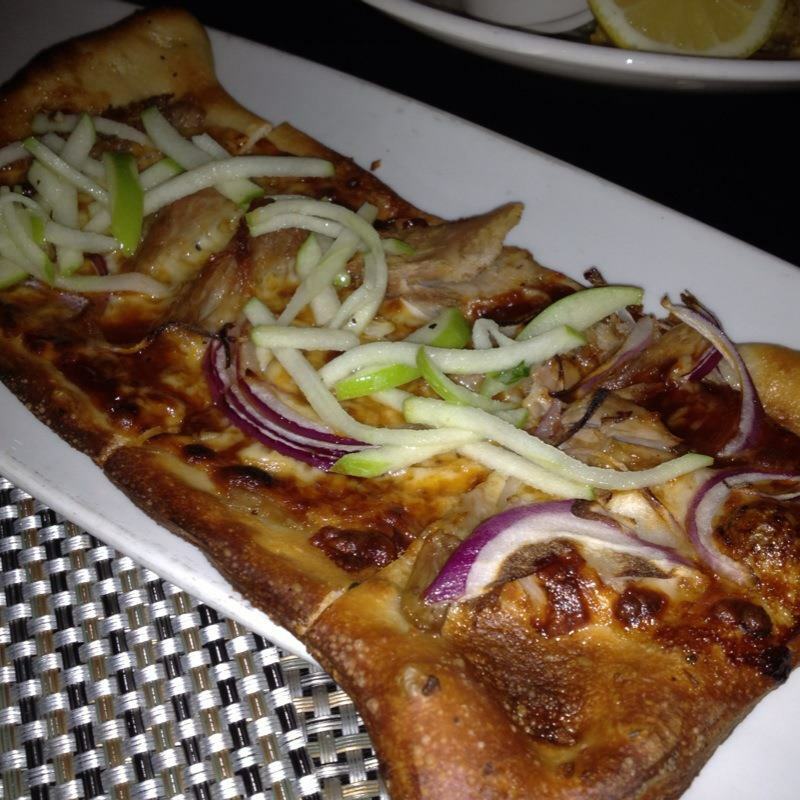 Tons of flavor but the roast duck is hidden under the strong flavors of the red onion and cheese. Maybe it would be better with a milder cheese? I really enjoyed this appetizer but did wish for the duck to shine. Perfectly grilled fish kept simple! I always believe fresh fish should be the center of a dish and simply grilling the thick swordfish steak was amazing. It was lightly seasoned, served with some lemon juice, and had just the right char! The sides were ok... the brussel sprouts were a little oily for my liking (cooked with bacon) and the mushroom leek mixture was almost too creamy. I wish I had stuck with the yukon gold mashed potatoes but I felt like trying something new this day. This dessert reminded me of a cannoli. The outer shell had a similar consistency and it was filled with a fluffy cream filling. 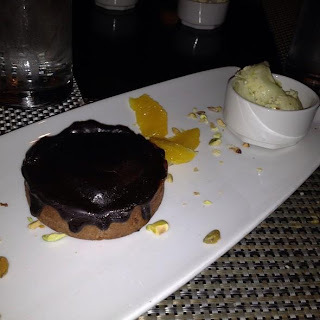 After being covered in chocolate, the dessert was topped with sliced oranges and served with a side of pistachio ice cream. This ice cream definitely made the dessert. Having chunks of pistachio made this ice cream completely different from the normal pistachio ice cream I have tried. It gave it the much needed crunch or texture change that makes desserts great. Super refreshing! This dessert is perfect for someone that wants to not only cleanse their palate but have a dessert that is sweet but not too sweet. The lemon meringue pie was good... it had a nice bite to it and looked amazing. But once again, the star was that mint-lime sorbet. 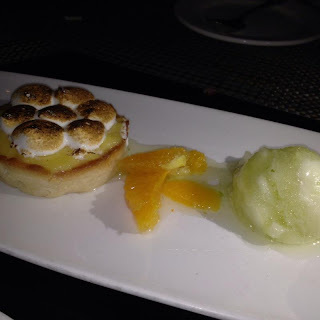 I definitely suggest having a small bite of the sorbet before the pie so you can taste the two components. They are both very subtle at first and pop out once you start eating the sweeter pie. - COME HERE FOR BRUNCH! They usually have a buffet for a special holiday and WOW! It is probably one of my favorite buffets just because many of their dishes are still made to order (different stations) and they also have a huge variety. It also the cost is much cheaper than the other buffets in the city, especially for Mother's Day! - Do try some of the other appetizers. I personally love appetizers and I think Devon does a great job packing them with flavor. I believe on certain days they have a happy hour special dealing with their appetizers and cocktails. - Do ask for more biscuits... they like bringing them out one by one so they stay warm... so don't be shy! - Do try the wine flights. They offer a few types and I enjoyed them all. - Don't order their Lobster Mac n Cheese. Yes it sounds amazing but I have had it multiple times and it doesn't live up to its hype. Minimal lobster and overpowering cheese flavor will most likely be your opinion if you do order it. - Don't come for restaurant week or any of the other special days. The options are extremely limited and portion size is disappointing. I recommend ordering off the regular menu at all times. - Try not to order the calamari. Though very tasty, it tends to be more of the fried jalapeños and other vegetables that stand out, not the calamari. great site i must say....very enjoyable stuff is placed here in a very appropriate way...thanks for publish this site…thanks for sharing it..its a good attempt.